The franc is a coin used in several countries like Belgium, France, Luxembourg, Monaco, Switzerland, Liechtenstein and part of the Francophone countries in Africa; the French franc is accepted as legal tender also in Andorra. All these coins are related to the French franc and the name seems to derive from the inscription "francorum rex" (in Latin "King of the Franks") used on the first French coin. The fraction of the franc is the centimes. The first franc was a gold coin of 3.87 g minted in France on 1360 to celebrate the release by the English of King John II ("the good"), captured at the Battle of Poitiers. Its value was equivalent to the one of the Tours pound (livre tournois). 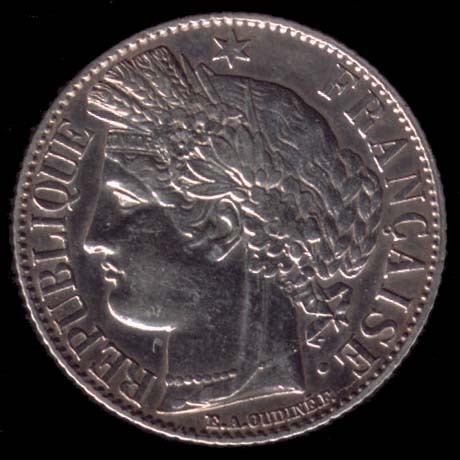 From 1360 until 1641, the French franc was the French national currency, then abolished as a legal coin by Louis XIII introducing the gold louis and silver écu in 1641. Reintroduced in 1795 after the French Revolution, the franc had a wide circulation thanks to Napoleon and his conquest of most of western Europe. The Kingdom of Belgium adopted the franc in 1832, following the independence from the Kingdom of the Netherlands, and so happened for Luxembourg in 1848 and Switzerland in 1850. Belgium, France, Italy and Switzerland created the Latin Monetary Union in 1865, with Greece following in 1868: their national currency unit (franc, lira, drachma) had the same worth, equivalent to 4.5 g of silver or 0.290 322 g of gold; in this way they were freely exchangeable at the same rate of 1:1. Due to the problems in maintaining a fixed rate for the value of gold and silver, the gold value became the new standard in the 1870s. After World War I, Belgium and France experienced a strong depreciation in 1926, and the monetary union collapsed at the end of the year. The monetary union of Belgium and Luxembourg was maintained, and it led a full economic union in 1932. All the French, Belgian, Luxemburgese and Monégasque franc ceased to exist on January 1, 1999, when they changed to the Euro. The official Euro-to-franc exchange rates were 1 EUR = FRF/MNF 6.55957, and 1 EUR = 40.3399 BEF/LUF. The Swiss franc (CHF) remains the coins used in Switzerland and in Liechtenstein and it is one of the world's strongest currencies. To be neutral among linguistic communities, the name of "Swiss Confederation" is written in Latin (Confoederatio Helvetica) on some of the coins.